Have you ever wanted to live in a house of the future? Just like in the movies when you can just walk into your house and tell it to turn on the TV, close the blinds, and make the house 74 degrees when it’s dark and rainy outside? Considering the prevalence of smartphones and now interfaces that allow you to control your home environment with apps, the future is not as far off as you might think. EcoBee is a smart thermostat that brings us that much closer. Heating and cooling is responsible for 50% of energy usage in the home, partly due to thermostats reading only one area of the house and keeping the temperature in that particular spot at a certain setting. Thermostats can be set to control the heat and cooling at certain times of the day, but there are a couple reasons this seldom works out. Programmable thermostats are often difficult to program, comparable to the same interface as a department store digital watch or microwave oven clock. Also, schedules change, making it tedious to reprogram the thermostat every single time. More often than not, people just hit the override button, which isn’t saving any money in heating and cooling costs. A smart thermostat enables you to make changes to your heating or cooling from your smartphone, meaning that your home can be the right temperature the moment you get home. What makes the EcoBee3 Smart Thermostat different? EcoBee integrates motion sensor control, easy to program interface controls, and is one of the few Apple HomeKit compatible smart thermostats on the market. These smart thermostats have been on the market since 2007 and are truly an innovative device when it comes to precise control of your heating and cooling. The EcoBee features a touchscreen interface with a variety of options, programmable features, and set it/forget it ease of use. What really sets the EcoBee apart from the competition is the addition of motion sensors which can easily be placed in any room of the home. The EcoBee comes with one sensor, but a bundled kit comes with three, and has a limit of 32 motion sensors in your home! The motion sensor is also where the temperature and humidity of the room is taken, and an average of temperatures throughout the home are used to determine the ambient temperature. This means that the thermostat will help customize your home’s comfort level and save you money by not heating or cooling seldom used rooms, or an empty house where there is no movement. Each sensor has a battery life of about 4 years, and EcoBee itself has a 3 year warranty and is easy to install and activate. What about EcoBee and Apple HomeKit? The interesting thing about EcoBee is how it works with Apple HomeKit, a system that in conjunction with apps, devices, and using AppleTV as a hub, can fully automate your home. From lightswitches to television, and now with EcoBee, the thermostat itself. There’s an EcoBee app that can be used to heat or cool your home while you’re on the go. You can adjust the thermostat via the EcoBee app when you’re anywhere in the world. It can also talk to your FitBit and adjust the temp based on your comfort levels while asleep or active in the home. Like just about any other Apple product, Siri can be used to set the thermostat anywhere you have access to Siri! EcoBee 4 is amazon Alexa enabled. The EcoBee interface will also let you keep track of your temperature control for upwards of 15 months, which is something none of its competitors do. EcoBee is also compatible with Samsung and Wink devices and apps. Unlike your standard thermostat, it comes preset with a standard template which you can easily modify from there based on your schedule and your needs. 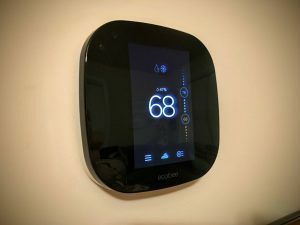 What do we think of the EcoBee smart thermostat? As you may have guessed, we’re really impressed and think you will be too. If you want to save money on your heating and cooling, and have your home the right temperature, all the time, what are you waiting for? Contact us at (651) 294-7798 to see how you can turn your home into a smart home today. Metro Heating and Cooling is here to get you started!